How does your car get its "energi?" Is it solar, nuclear, coal-fired, wind, natural gas? However it gets its power, chances are you aren't really helping Person Earth unless your car is solar powered - in which case it isn't much practical use considering the state of the art today. If your raison d'être for going electric is gladdening Gaia, have fun explaining how mining the material for, transporting, building and eventually disposing of all those batteries helps the environment. Not only that but, since weight is the enemy of efficiency, how exactly do those extra kilos of batteries help? On the other hand, if you just don't like spending more money on gasoline than you have to, the lack of electric-powered range doesn't bother you, you don't mind the cash premium for electrification (despite government grants that force your neighbors to help pay for your car) or you simply must have the latest whiz bang technology (let alone great torque! ), an argument can be made for electric vehicles. Carmakers are certainly making arguments for them, spurred on undoubtedly by government-imposed average fuel economy regulations and lots of propaganda. Advances in technology haven't hurt, either: the days of electrified vehicles always being gutless no-fun buggies are gone – if you buy the right electrified vehicle. Vehicle electrification comes in three main ways right now: fully electric, plug-in hybrids and conventional gas/electric hybrids. Ford is pushing its electric offerings in all three ways, through vehicles such as the Focus electric, C-Max hybrid and the subject of this piece, the Fusion Energi. The Fusion Energi is a very nice car indeed. It's a Fusion, after all. As a plug-in hybrid, however, it's kind of schizophrenic because, on the one hand, it offers completely electric performance while, on the other hand, it's short-lived all-electric performance and before you know it you're back destroying the universe again with its infernal internal combustion engine. That said, the changeover from volts to liters is seamless; the only way you can tell is by watching the instrument panel – which isn't recommended unless you're interested in trying out forward crash mitigation technology (which this car doesn't offer yet anyway). Under the hood, the Fusion Energi is pretty much the same as the Fusion Hybrid, which means it comes with a 141horsepower, two liter four cylinder Atkinson-cycle engine coupled to electric stuff that brings the augmented oomph ante to 188 horses – not huge for a car this size but competitive enough with other four cylinder cars in this niche. That electrical oomph comes at a price beyond mere money, though, including a battery pack that turns the Fusion's otherwise generous trunk into something more suitable for carry-on luggage rather than suitcases. Still, thanks to the plug-in technology, you can head out in all-electric mode and not bother using the "conventional" technology at all, even if you're attacking the freeway at highway speeds. In our week with the Fusion Energi Titanium sample provided by Ford of Canada, we took a trip from Calgary to Red Deer and back, leaving our cow town base with the Energi in full electric mode to see how far we could get before the batteries ran down. It only took about 30 kilometers for that to happen, which means that the other 260 or so klicks were driven with the Fusion Energi performing as a regular hybrid, which made electric-only operation pretty useless for a trip such as that. On the other hand, when charged fully it could complete the commute from Chez Bray to Calgary's downtown core and back on electric power only, which makes the concept more practical while still giving you the gas/hybrid operation as a longer range backup for those times you do want to roam farther from home. And even with its limited electric range you can't argue about the Energi's overall efficiency. After a week of driving as if it weren't an electric car (i.e. by dropping a chunk of right foot-shaped lead on the gas pedal), the Fusion Energi still gave a combined fuel mileage of 4.1 liters per 100 kilometers, which is nearly 69 miles per gallon. Remarkable! Alas, as of this writing we haven't received our hydro bill, so it's impossible to tell how much extra we spent on electricity to keep the car "current." And that's a calculation that really needs to be factored in to get an honest estimate of your driving costs. In practice, we plugged the car in each time we parked it in front of our house, hooking it into an outside socket via the included charger and cable (which, alas, was about 20 feet too short, forcing us to use an extension cord). It would charge completely overnight but you could drive it even if it weren't charged fully because of its gas/hybrid capability, though that kind of defeats the purpose. One thing you really notice about all-electric mode – or don't notice, in fact – is how quiet it is! It should come with a rotating beacon or a siren or something to warn obliviously plugged-into-their-music players pedestrians that you're approaching. Most Fusions are front wheel drive (you can get awd with the EcoBoost engine option) and the hybrid versions get their power to the wheels through an electronic continuously variable transmission that works well, though as with most CVT's it doesn't add a lot of joy to the drive. Ford's sample Fusion Energi Titanium came with the full meal deal of options, including the newest version of the MyFord Touch interface which, while improved over the original version, still requires so much twiddling with the steering wheel-mounted controls that you could very well mow something down while you twiddle. There's voice control, but I had problems getting it to either listen to or understand me (Ford may have consulted with one of my sons), though we'd probably make peace before too long. There's also a nice new touch pad below the center stack's LCD screen that works great, and the LCD touch screen is pretty easy to fathom as well. Alas, the screen is quite far away from the driver's seat and may be a bit of a stretch for the diminutive. Other than these wrinkles, however, the Fusion is a pretty nice place to be, with comfortable seats, a good driving position and about as much technology as you could want. Opt for options and you get even more stuff, such as Ford's fascinating parking assist feature that really will parallel park the car for you, though use of such a device should force forfeiture of your driver's license. Ford's sample Energi also had adaptive cruise control, a navigation system, blind spot monitor and lane departure warning (it slaps the driver with a dead fish). 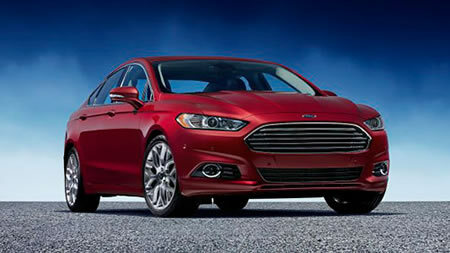 The base four cylinder Fusion starts at $21,369 and the hybrid can be had $27,649. That makes the Energi's starting price of $35,570 quite a pill to swallow – and Ford says it's only a four seater as opposed to the other Fusions' five places. Granted, you will save quite a bit of money on gas over the life of the vehicle, but is that enough? As if that price disparity isn't enough to make you think, the gas-powered Fusion Titanium, with its two liter EcoBoost four cylinder engine and all wheel drive, lists for $38,093 loaded, according to Ford's Canadian website. Ford's sample Fusion Energi listed at $47,889, as tested. You can buy a lot of gas for that extra outlay! Still, if you have the cash to finance your gas savings up front, the Fusion Energi is a very nice car. If your commute is short or your place of employment offers charging (it isn't cool to just steal electricity), it could fit your bill nicely. Regardless of which side of the electric car opinion ledger you come down upon, it seems that electric cars are here to stay – at least until they get rendered obsolete by whatever comes next. Natural gas? Propane? Hydrogen? V6-sized nuclear reactors? Who knows? Hopefully, whatever the next big wave may be will still allow for interesting vehicles to drive!